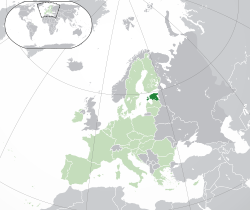 Estonia i/ɨsˈtoʊniə/ (Estonian: Eesti), officially the Republic of Estonia (Estonian: Eesti Vabariik) is a small country in the Baltic Region of Northern Europe. The capital city is Tallinn. Estonia's neighbors are Sweden, Finland, Russia and Latvia. Its population is 1,332,893. ↑ "Population by ethnic nationality, 1 January, year". stat.ee. Statistics Estonia. http://www.stat.ee/34278. Retrieved 2 July 2012. ↑ "Statistics Estonia". Stat.ee. 1 January 2011. http://www.stat.ee/main-indicators. ↑ (in Estonian and English) (PDF) 2012. Aasta rahva ja eluruumide loendus (Population and Housing Census). 1. Statistikaamet (Statistical Office of Estonia). 2012. ISBN 9985-74-202-8 . http://www.stat.ee/63779. ↑ 4.0 4.1 4.2 4.3 "Estonia". International Monetary Fund. http://www.imf.org/external/pubs/ft/weo/2012/01/weodata/weorept.aspx?pr.x=47&pr.y=9&sy=2009&ey=2012&scsm=1&ssd=1&sort=country&ds=.&br=1&c=939&s=NGDPD%2CNGDPDPC%2CPPPGDP%2CPPPPC%2CLP&grp=0&a=. Retrieved 18 April 2012. ↑ 5.0 5.1 "Human Development Report 2011". United Nations. 2011. http://hdr.undp.org/en/reports/global/hdr2011/. Retrieved 14 August 2011. ↑ "Household Download Index". http://www.netindex.com/. Retrieved 12 February 2012. This page was last changed on 20 December 2014, at 14:13.